LG isn't doing so great in the flagship department these days, but the company's budget phones have usually been solid in recent years. 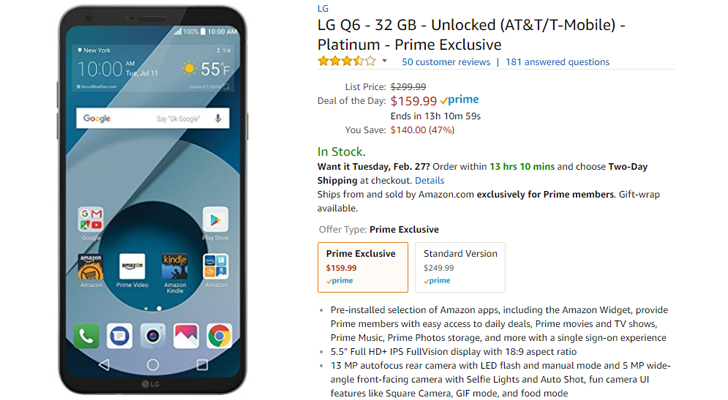 The LG Q6 is one of the few mid-range devices with an 18:9 aspect ratio, and now you can get the Prime Exclusive version on Amazon for just $159.99 ($90 off the original Amazon price). The Q6 has a Snapdragon 435 chipset, 3GB RAM, 32GB of storage, and a 3,000mAh battery. The back camera is 13MP, and the front is a wide-angle 5MP lens (similar to the front-facing camera on the LG X Venture). The screen is 5.5-inches, with a resolution of 2160x1080. As for the software, it's running a skinned version of Android 7.1.1 Nougat. Even though the Prime Exclusive phones no longer have lock screen ads, you still get some preinstalled apps and a permanently-locked bootloader. If that's worth the massive savings of $100 (compared to the non-Amazon model), you can get it at the source link below.